Q. How old does my car have to be to go on "Club Plates"? Classic and Historic motor vehicles (vehicles built after 31/12/48) but more than 25 years old. Veteran, Vintage, and pre 1949 motor vehicles. Street Rods (pre-1949 and replicas of pre 1949 street rods). Only the Australian Street Rod Federation can authorise these vehicles on SR plates. Mobile plant and machinery (Including tractors farm equipment and road machinery). Q. Can P platers drive V8 CPS vehicles? A. Yes. Because the CPS is considered to be a permit by VicRoads there are no power restrictions on P platers. Q. Is the world going to end if P platers drive V8's? Q. What sort of vehicles will the club allow? A. Anything that complies with VicRoads regulations. The Australian Street Rod Federation have exclusive rights to Street Rod registration. It is a good system and the ASRF are well respected and very good at it. There is a new "Modified" registration which has slightly different engineering standards. Vehicles on SR plates must be VASS re-engineered to go on M plates. A fully registered "Street rod" with an old VASS engineers certificate can go on M plates. e.g. A fully registered 1932 roadster with an existing VASS certificate, scrutineered and complies with VSI 33 etc is eligible for M plates. If in doubt check the VicRoads website and read up on the VSI 33, 14, 22 etc. etc. Do your homework. Q. Is the owner responsible for his car? A. Yes. Within the controlling legislation it is very clear the owner of the vehicle is responsible for their vehicle's compliance with VSI 33, Road Rules etc. If it comes to the attention of the club that the vehicle has been made to not comply we will seek to have the vehicle brought back to standards. If the owner refuses VicRoads will be notified. It has happened. Q. Is it easy to change clubs? A. It is very easy to change clubs. Usually, no roadworthy required. VicRoads must be notified with a letter from the owner stating they have changed clubs. The usual VicRoads forms and another letter from the new club stating the owner is a member of the club. New photos of the vehicle should be taken and the vehicle scrutineered. This is to ensure the car is as the owner claims it to be. All this can be done in an hour. Then the paperwork has to be personally delivered to VicRoads office by the owner. A new sticker for the log book is issued. Q. 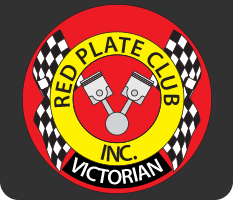 How would you describe the Victorian Red Plate Club in comparison to other clubs? A. We are not in the business of poaching from other clubs. There are 980 clubs in Victoria and they are all slightly different in their goals and aspirations. Some clubs are very political and lobby the government with their own agenda. Others are secretive and accept no other members. We tend to cater to the professional who does not want the politics of clubs. There are no compulsory meetings to attend or club runs. There are no selling of raffle tickets. If you are in a specific collectors club for social reasons we encourage you to stay in contact with that club. Our members tend to like to remain confidential. We cater for all sorts of vehicles, not just cars. Q. Do you have club runs? A. No. Members details are confidential. They can't be confidential if we tell everyone. We encourage everyone to join in with other groups or events as they can. At some time in the future we may have a Red Plate Club shindig. That will be a "Party" to remember. Q. What do I do first? A. There are a group of things you must do to get red plates. The order of things is not critical BUT when you go to VicRoads all those things must have been done correctly. The secretary, me, the guy that edits this website will ensure you have everything as it should be. The owner has to make an effort too. Read the website, do some homework and learn what it is you need to know. Ignorance is no excuse. Q. Do you have club runs or events? A. Again, NO. This is the most popular question and causes a lot of anger amongst other die hard socialist club members. The reason is not immediately obvious. To explain, we have a broad range of members who should never be forced to meet. e.g. We have many Outlaw Motor Cycle Group members and even more police. These 2 groups don't mix well. It's just not a good idea. We have earned the respect of both groups & will not jeopardize that. Q. It is rumoured that you are the best club around. Is this true? Q. Do you give free advice? A. Yes. This is it. Q. Are you cooler than the Cranksters? A. No one is cooler than the Cranksters. They define what is cool. Q. How large is the club? A. The members register is confidential. We can reveal our vehicle register is over 660 and growing. Q. Where is the club based? A. The committee members are in Shepparton. We have members all over Victoria. Q. Can I register my car if I live interstate? A. Yes. A car must be garaged in Victoria to be eligible for red plates. There are people who live in other states & countries who have cars on red plates. Even if you live in Perth, the most remote city in the world in Western Australia & speak with a weird Pommy accent you can have a car in the Red Plate Club. Q. Who are the scrutineers? Q. Does the club allow dodgy cars? A. No, of course not. Don't even ask. It doesn't matter that other states or countries have different rules etc. We must comply with Victorian rules, VSI 33 etc. Be aware of the requirements. It is easier to comply than to not. Q. If my car requires a VASS engineers certificate can I not get one if I whinge and sook a lot? A. No. Good luck with that. Q. Are slim line plates or smaller plates available? A. According to Section 157G of the RS(V)R 2009 there is a facility within the law for slim line plates. Also, a small club plate for a bike rack. An application must be made to VicRoads and there will be a fee. We haven't seen a slimline plate and of the belief VicRoads do not have a facility to provide such plates but If someone wants to be the first, go for it. Q. Is it likely that personalised plates will ever be used for club registered vehicles? It’s all about money. The longer the vehicle is on personalised plates and therefore full registration the longer the government maximises revenue. Apart from the $500 outlay for personal plates a car that is on full rego for 30 years brings in over $20,000. 30 years ago the average price of a new car was $5,000. A car is big money for the government & economy. There are about 4.5 million vehicles registered in Victoria bringing in about $3.3 billion per year revenue. Personalised plates are big business. VicRoads are not likely to do anything that may reduce their revenue stream. For any change to happen, people need to realise that personalised plates are an expensive vanity. There needs to be a rejection of that marketing ploy. To those that insist on having personalised plates on their old cars we thank you. You should feel warm and fuzzy for your contribution to the state coffers. At some point in the future a financial advantage to VicRoads could be demonstrated by having personalised plates on Club Registered vehicles. One thing is certain, the rules change constantly. Who could predict what may happen in a few years now the CPS genie is out of the bottle?